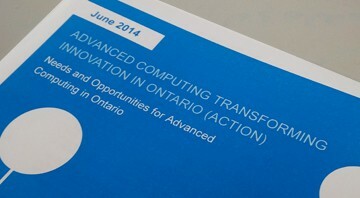 The Advanced Computing Transforming Innovation in Ontario (ACTION) project brings together leaders in the research and advanced computing sectors from across the province to assess the needs and strategic opportunities for the future of advanced computing (AC) in Ontario. Based on interviews with leading researchers and community feedback, the ACTION report highlights some startling facts about the lack of resources that Ontario’s researchers face every day. By assessing the current and future needs for advanced computing, this report offers practical and affordable recommendations while exploring potential solutions to support demand and ensure Ontario remains a competitive source of ground-breaking research well into the future. Why is ORION interested in AC? The answer is quite simple: ORION connects universities, research hospitals and research institutions — and all of them have used or will use AC. With more than half a million researchers using our network to complete their work, it is important for ORION to understand their AC needs in order to ensure that the required connectivity and next generation of network-enabled services are available to them. The goal of ACTION is to identify gaps in AC resources and determine which priorities need attention. We see this project as a key step towards improved provincial collaboration on AC and High Performance Computing (HPC). Through community consultations, workshops (such as the one held in February 2014) and detailed reports, we are helping to forge the ACTION path forward to provide Ontario’s researchers with the tools they need to solve the world’s problems. The project was sponsored and managed by ORION, with support from the Ministry of Research and Innovation and in collaboration with Ontario HPC Centres, OCE, health research institutes, industry and academia. Bill Appelbe worked with ORION to manage this project. ORION is currently working on some of the recommendations in the June 2014 ACTION Report. What is “High Performance Computing” – and why do we need it?